MEXICO CITY (Reuters) - Mexican drug kingpin Joaquin "El Chapo" Guzman may end up with a life sentence after a U.S. jury found him guilty of running a criminal enterprise but it looks like business as usual for cartels and Mexican officials struggling to contain them, security experts say. Guzman, 61, was found guilty on all 10 charges in federal court in New York after an 11-week trial that revealed the inner workings of the Sinaloa Cartel, Mexico's biggest drug gang. 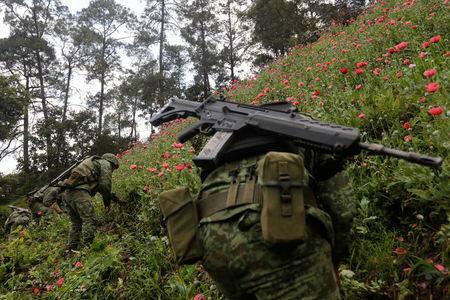 Largely because of that, the trial has not changed the "rules of war" against the drug trade, security analyst Alejandro Hope said, aside from perhaps scaring cartels into exercising more caution after testimony revealed how law enforcement infiltrated Guzman's networks. Among the capos still at large in Mexico is Ismael "El Mayo" Zambada https://www.reuters.com/article/us-mexico-guzman-zambada-idUSKCN0UQ0QE20160112, Guzman's long-time partner who keeps a low profile and is believed to have taken over Sinaloa Cartel operations since Guzman's capture in 2016. Trial testimony drew attention to allegations of corruption and million-dollar bribes doled out to government officials - but on those counts, too, there is little sign the courthouse drama will bring change, despite the focus of Mexico's new President Andres Manuel Lopez Obrador on cleaning up politics. Mexico, not the United States, bears the burden of investigating the trial's wide range of criminal allegations, said Guadalupe Correa-Cabrera, a scholar at Rice University's Mexico Center. She said she doubted that the new government would take serious action about allegations that officials took bribes since Lopez Obrador has said he does not want to rake over the past. "It's a big circus, but nothing happens in the end," she said. For sure, Lopez Obrador is attempting a new approach to Mexico's drug cartel problem. He has said that more than a decade of war against drug traffickers is officially over, and is exploring a crop substitution for illicit crops, relaxing prohibition and amnesties for low level drug dealers and farmers. "There haven't been any capos arrested, because it's not our main purpose," Lopez Obrador, who took office in December, told a recent press conference. "What we're looking for is safety, to lower the number of daily homicides." Despite the absence of Guzman, murders across Mexico have climbed steadily. In 2018, the first full year since Guzman's extradition, murders rose 33 percent, breaking the record for a second year running, official data showed. Guzman's home turf of Sinaloa, however, has bucked that trend. The murder tally in the northwest state fell in 2018 to its lowest since records began over two decades ago. Over the same period, Zambada has consolidated power for the Sinaloa Cartel, diversifying into criminal activities besides drug smuggling and capitalizing on blows to its rival Jalisco New Generation Cartel, a former DEA agent told Reuters https://www.reuters.com/article/us-usa-mexico-elchapo-sinaloa/even-behind-bars-el-chapos-robin-hood-luster-glows-in-mexico-drug-capital-idUSKCN1PO2CQ. The trial also brought to light testimony accusing Guzman's sons of murdering prominent Mexican journalist Javier Valdez over his coverage of cartel infighting in Guzman's home turf state, Sinaloa. "Beyond the process that's underway in the courts in New York, we have the firm goal of getting to truth," she said at a press conference, after being questioned by Valdez's wife.